Color Temperature is a measurement in Degrees Kelvin that indicates the hue of a specific type of light source. You can use a Color Temperature (as shown in the chart below) to suggest realistic colors for the lights in a 3D scene. Visible colors are relative to the Color Balance (or White Balance) of a film stock or video camera, with the two most common fixed settings being 3200K Indoor color balance, and 5500K Outdoor (Daylight) color balance. To pick an RGB value from the chart below, first choose whether your scene would be shot with Indoor or Outdoor film (usually chosen based on the dominant lighting), then find the color corresponding to the type of light source at that color temperature. So, why do we measure the hue of the light as a "temperature"? This was started in the late 1800s, when the British physicist William Kelvin heated a block of carbon. It glowed in the heat, producing a range of different colors at different temperatures. The black cube first produced a dim red light, increasing to a brighter yellow as the temperature went up, and eventually produced a bright blue-white glow at the highest temperatures. 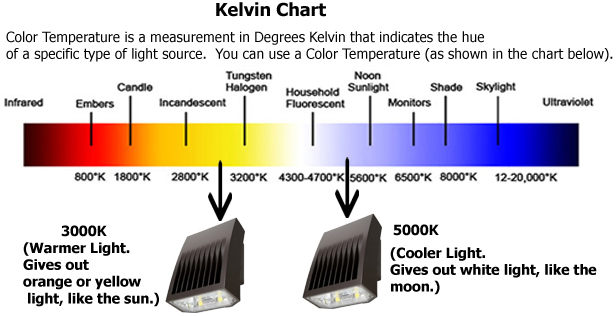 In his honor, Color Temperatures are measured in degrees Kelvin, which are a variation on Centigrade degrees. Instead of starting at the temperature water freezes, the Kelvin scale starts at "absolute zero," which is -273 Centigrade. (Subtract 273 from a Kelvin temperature, and you get the equivalent in Centigrade.) However, the color temperatures attributed to different types of lights are correlated based on visible colors matching a standard black body, and are not the actual temperature at which a filament burns.